and to equip others to do the same! Our desire is to reach the youth, whose culture changes constantly, with the TRUTH that never changes! 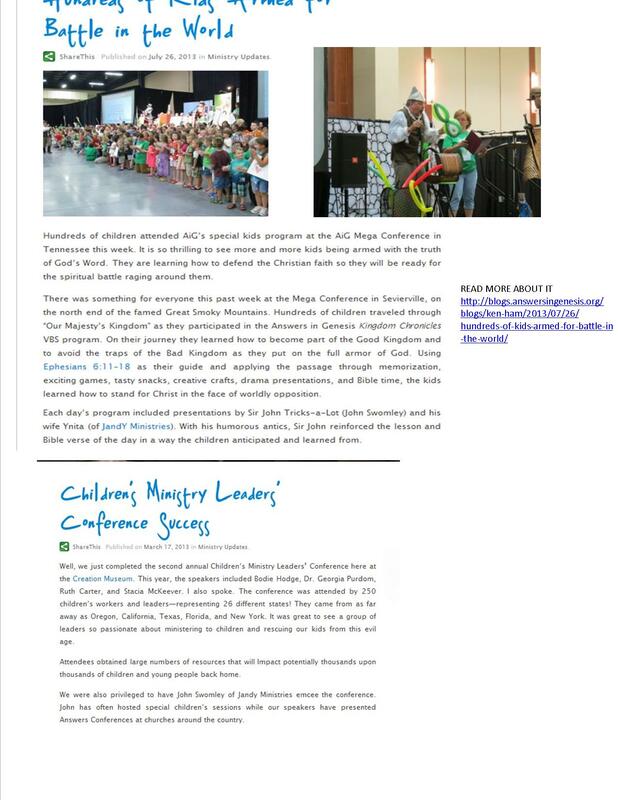 "In addition to my presentations, John and Ynita Swomley did parallel sessions for the little kids using “magic”, puppets, balloon modeling, etc. They are really gifted for this kind of ministry and I heard rave reviews from people in the church who had kids in their sessions. I highly recommend them, if your church would like some quality children’s ministry that will teach your youth about creation and so much more. "I just want to thank you for the awesome job you did with the children at our conference. I have heard so many good things from the parents of the children who attended your sessions. I'm so grateful for your ministry and that you offered to be a part of our event. I pray that God continues to use the both of you to reach out to children with the truth of His Word." The boys were so excited about the JANDY presentations that occurred this weekend. Each night they came home excited and very talkative. Even though they were a bit tired, they thoroughly enjoyed it and learned quite a bit from it. When we told them that the presentations were only for Sunday and Monday evening, they were very disappointed and said they wished that it would continue longer! We were amazed at this attitude and are very thankful for the time, effort, and blessings that were poured into our children this weekend. Thank you so much!